Artiodactyla is the order of mammals which includes modern pigs, peccaries, hippos, deer, antelope, giraffes, and cattle. Members of this group are characterized by having limbs in which the main weight of the body is equally distributed through the third and fourth digits of each foot. As a result, these animals have a tendency to reduce the number of functional toes from five to just four or two. For this reason, artiodactyls are commonly referred to as the “even-toed ungulates”. 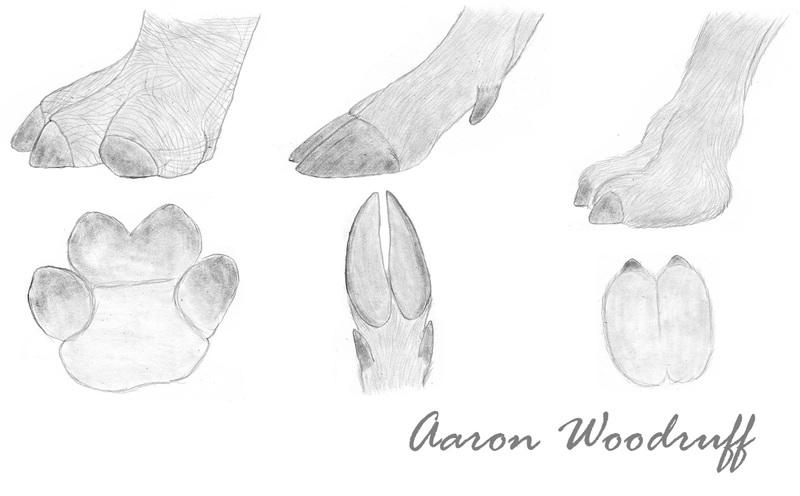 Perissodactyls, the “odd-toed ungulates”, differ in that the main weight of the body is distributed through the third digit with the number of functional toes being reducd down to three or one. The name Artiodactyla was coined by the renowned English scientist Sir Richard Owen in 1848: derived from the Greek words artios, meaning “even”, and daktulos, meaning “finger”. Cetaceans (whales, dolphins, and porpoises) descended from early artiodactyls during the Eocene and are close relatives of hippos, leading some authors to combine the Cetacea and Artiodactyla into a common order known as “Cetartiodactyla”. digits are always absent, resulting in an even number of toes. The first artiodactyls are known to have lived in Europe during the early Eocene, a time when perissodactyls were the dominant terrestrial herbivores. The oldest known artiodactyl, Diacodexis (Dichoubunidae), was a rabbit-sized animal with bunodont dentition. Already, its limbs anatomy was highly modified for running with specializations that would be inherited by all later artiodactyls. 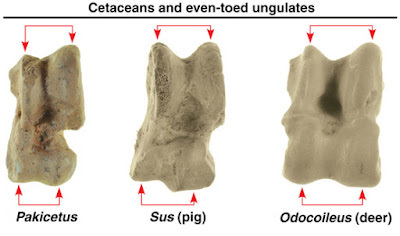 The first cetaceans appear in the fossil record shortly thereafter, but these highly derived animals will be covered in a separate blog post. 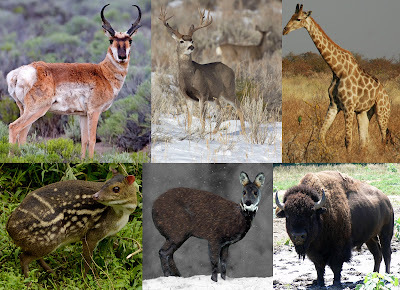 Disregarding their aquatic relatives, artiodactyls are among the most successful order of mammals, having diversified in the past 10 million years into a wide array of families, subfamilies, tribes, and genera, native to every continent except Antarctica and Australia. There are 10 modern families with 240 species between them. The order is subdivided into four suborders: Whippomorpha, Suina, Tylopoda, and Ruminata. Whippomorpha- Whippomorpha is a group which contains the earliest artiodactyls and cetaceans. 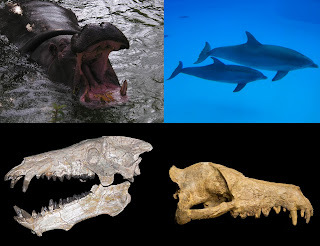 Traditionally, the families Hippopotamidae (hippos), Anthracotheriidae (anthracotheres), and Entelodontidae (entelodonts) were been placed within the Suina for morphological reasons. However, a 2009 study of artiodactyl phylogeny has since found that these three families, together with the middle Eocene predator Andrewsarchus mongoliensis, are much more closely related to Cetacea than they are to other artiodactyls. Barring the cetaceans, members of this group are the least derived among the artiodactyls with a history dating back to the early Eocene. Suina- The Suina, or “pig-like artiodactyls”, contains the modern families Suidae (pigs) and Tayassuidae (peccaries). These animals are characterized by having relatively robust heads with specialized nasals which support a distinctive snout which ends in a disc-shaped nose. Their bodies are typically robust, and cursorial adaptations are minimal. These animals first originated in the Northern Hemisphere during the early Oligocene. Members of this group may be either hypocarnivores or specialized herbivores. Representatives of the suborder Suina: pigs (left) and peccaries (right). 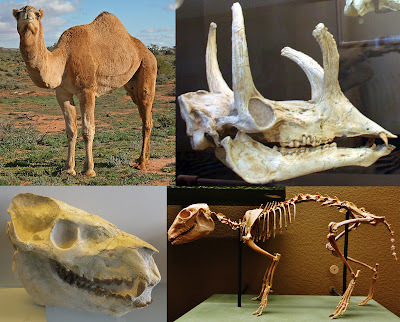 Tylopoda- The Camelidae (camels) are the sole modern representatives of the group Tylopoda, a group which branched away from other artiodactyls during the middle Eocene. Extinct members of this group include the endemic European families Xiphodontidae and Cainotheriidae and the endemic North American families Protoceratidae and Merycoidodontidae. The latter family were once erroneously placed within the Suina due to their common, yet inaccurate description of “ruminating hogs”. First, food is consumed and stored in the first and largest chamber (rumen) where it mixes with saliva and microorganisms which begin to breakdown the tough cell walls of the plants. After feeding, this stored food will gradually be regurgitated and rechewed over a period of time to allow further breakdown of plant fibers, as demonstrated here. The "cud" is then reswallowed and transferred to the second chamber (reticulum) where smaller, unwanted debris is trapped. Food is then passed to the third chamber (omasum) where any large particles are broken up and moisture is absorbed. Finally, the food travels to the fourth chamber (abomasum), or the "true stomach", where it is exposed to digestive enzymes and acids before it enters the small intestine. 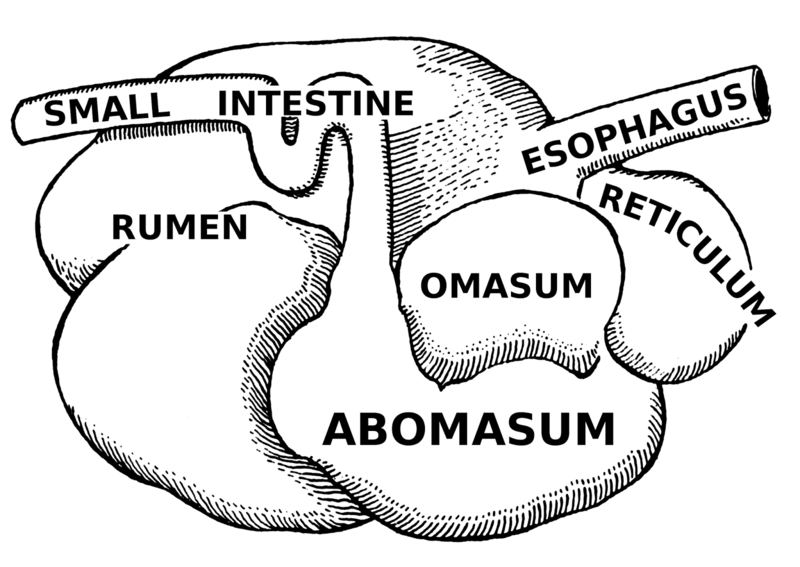 Click here for a more detailed description of the anatomy and function of the ruminant digestive tract. Through this process, ruminants are able to 1) quickly consume large quantities of food at a given time to be digested at a later period and 2) to extract nutrients from their food more efficiently than competing herbivores. of the multi-chambered ruminant stomach. Wiki. Most ruminants lack upper incisors, instead having a toughened pad which occludes with the lower incisors. The cuboid and navicular bones of the hindfoot have fused together, forming the cubonavicular bone. Additionally, many ruminant families have independently evolved paired head projections used for species identification, gender identification, and combat (horns, antlers, pronghorns, or ossicones). The first true ruminants appear in the fossil record at the end of the Eocene and underwent a gradual increase in diversity from the Miocene onward. All artiodactyls (including the earliest cetaceans) share a double-hinged astragalus* that features two symmetrical, pulley-shaped surfaces. This innovation has provided significant advantages for cursoriality: it restricts movement of the foot to the vertical plane and allows leverage to be altered as required. This adaptation is similar to the mechanism possessed by perissodactyls, albeit somewhat more sophisticated. Artiodactyls also share with perissodactyls a reduction or loss of the clavicle (collar bone) which allows them to maximize their stride length while running. The first digit (the equivalent of our thumbs and big toes) is absent in all species. Most artiodactyls have “cloven hooves”; having unguligrade feet in which the weight-bearing third and fourth digits are enlarged while the lateral digits are reduced or absent depending. Among modern species, only hippos have functional lateral digits that actively play a role in locomotion. Camels have a unique foot morphology in which the toes splay out and the body weight is supported by fatty pads, making them effectively digitigrade. articular surface, a unique and defining feature of the order Artiodactyla. Astragalus: the ankle bone which connects the foot to the rest of the leg.